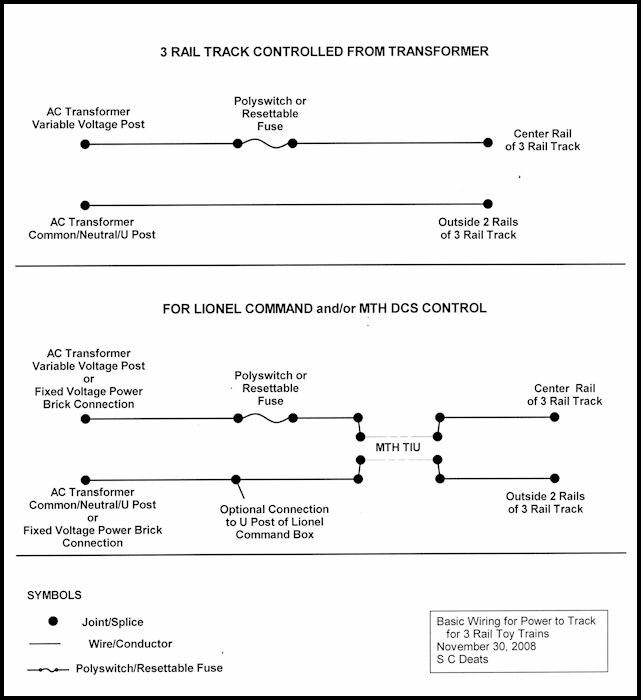 All power feeds from toy train transformers must have circuit protection in the line. Use the lowest value protection that will hold the circuit closed. Track for passenger cars will require the highest value protection. Click here to see a photo sequence with notes and links. Use this no solder terminal strip to protect a circuit when sizing fuses and breakers for circuits. For maximum protection choose the fuse or breaker with the lowest amp rating that will hold while operating the load to be protected. Resettable fuses and breakers will reset when power is turned off and fault is cleared. The PTC resettable fuses used in this illustration are very hot to touch when tripped so the indicator light is nice to have. 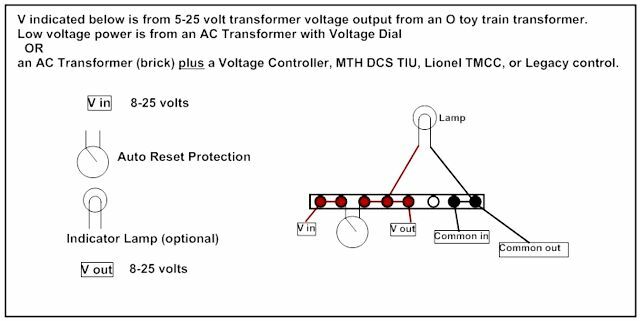 Since PTCs are inexpensive, automatically reset, and are available in a wide range of ratings they are a good choice for testing and all ac toy train loads. The stranded and silver looped wires make the screw terminals common. The orange PTC is rated 1.1A Hold/2.2A trip at 30V. One lamp wire is connected to the load side of the PTC and the other lamp wire connects to Common. The load wires to track. turnouts or accessories are connected to the three screw terminals to the right of the orange PTC. Substitute various size PTCs in above terminal strip. A PTC rated 3A Hold/6A Trip at 30V is good for a circuit feeding accessories. Power to track turnouts may be better with the 1.1A/2.2A protection for turnout circuit protection. The indicator light is on when there are No faults in the line. A 3A Panel Mount Circuit Breaker similar to the one shown above would be part #W28-XQ1A-3 by TE Connectivity. The button extends for visual trip indication. A 3A Panel Mount Circuit Breaker would be preferred for a child's layout because they can see the trip indicator. The PTC Resettable Fuses (orange square and round PolySwitches) open with a short or overload and automatically reset when fault is cleared and power is recycled. The PTC Resettable Fuses provide precise and economical circuit protection. The functional life of PTC Resettable Fuses depends on the stresses imposed. Indications of failure would be false trips or failure to trip. To date, there have be no reported toy train use PTC failures. If in doubt, periodically replace PTCs that see heavy use. PTC Resettable Fuse devices are commonly called resettable devices to distinguish them from traditional one-shot fuses that work only once and then must be replaced - an expensive and inconvenient proposition. Technically these are not fuses but actually non-linear thermistors. MultiFuse is made by Bourns. Polyfuse is made by Littelfuse. PolyTron is made by Cooper Bussmann. PolySwitch is made by Raychem which is a division of TYCO Electronics. These 4A PolySwitches protect track for short PS2 powered freight trains. Use RUE or RXE series - Always use the smallest one possible. Two of my operating accessory circuits have been raised from 3A (650-RUEF300) to 4A (650-RUEF400) . With several people operating different accessories at once I had to up the rating. For my Z-stuff switch machines circuit, I use 2 1/2 A 650-RUEF250. Terminal strips afford the best wire connections. Solder terminals together for common connections. Polyswitches and Panel Mount Breakers are interchangeable.